A roaming bull has forced one of Vietnam's main airports to close temporarily, disrupting numerous flights. 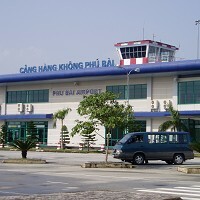 Services at Phu Bai Airport in the city of Hue ground to a halt on Tuesday morning and remained shut until 6pm (11.00 GMT) due to safety reasons. The animal was first spotted on Monday wandering around a wooded area that borders the runway. Around 100 police officers, soldiers and rangers were called to deal with the situation and prevent the bull crossing the landing strip. It was tranquilized and removed on Tuesday. Airport director Do Chi Thanh said bulls haven't been spotted in the area before and it's unclear where this particular bull came from. If you're jetting off this summer then remember to protect yourself with the necessary travel insurance.